If you're going to get skin cancer, I recommend basal cell. It's the kind of skin cancer that is diagnosed with a casual "and here we have some basal cell skin cancer" from your dermatologist. It's also the kind of skin cancer that can be treated, quite effectively, by an outpatient surgery called Mohs Surgery. Then, once you schedule your surgery, I recommend having your child's kindergarten orientation scheduled for the very same day. It will help keep your mind on other matters during the surgery, such as I hope he doesn't cry. I hope I don't cry. It's okay if he (or we) cry, rather than the fact that your face is being dissected and placed under a microscope. Thursday morning, with my parents in charge of the kids for the day, Sam and I went back to Advanced Dermatology for the procedure. We got there early (of course we did), and were back in the office before my 9:30 appointment time. I took this as a very good sign. I explained to the nurse that, though I understood that Mohs Surgery may take several rounds and many hours to complete, I was really hoping to get home by 2:30 so I could bring my 5-year old to Kindergarten Orientation. She nodded understandingly and said, "I'll let Dr. N know. Now, if you're going to need Plastics to come in and close, we'll have very little control over your schedule. He may not even come in until 1 or 2, but we'll get you in with him as soon as possible." Plastics. Plastic surgery. Because they were going to be cutting into my forehead. "Unless, of course," the nurse continued, "Dr. N thinks she can close. She'll always leave noses and lips to plastics, but if she can get a clean line, which is likely on a forehead, she'll do it. She's an excellent closer. Just keep fingers crossed that we don't need to go in there more than once." I crossed my fingers and exhaled a grateful breath that my *just* basal cell is *just* on my forehead. She applied a numbing cream, which was to ease the pain of the forthcoming shot of anesthetic. Step 1: Remove the tumor-containing tissue. Step 2: Thinly slice the tissue and place on slides. Step 3: Analyze under a microscope to determine clear margins around all edges and layers of tissue. Step 4a: If margins are clear, close the wound. Step 4b: If margins contain cancer cells, repeat steps 1-3. I could be out of there in a couple of hours....or at the end of the day. She injected the anesthetic into my forehead and left the room. I could feel the numbness spread out from the injection site, down the left side of my face, up the left side of my scalp. "It feels so weird," I said to Sam, "like I have a bubble in my forehead pushing the skin up." "Oh, really?" Sam responded, noncommittally. "Hmm." We talked about other things, mostly Max and Kindergarten, until Dr. N returned. She got right to work. She covered my eyes with a cloth and spoke quick, quiet directives to the nurse. Sam stayed in the room and watched the whole thing. I could feel pulling, some pressure, and some scraping...but no pain. It was uncomfortable, though, like getting my wisdom teeth removed; I could hear enough to make me feel like I could visualize what they were doing. It wasn't pretty. After only several minutes, Dr. N completed the removal of the first round of tissue. "Would you like to see it?" the nurse asked. I looked at Sam. "Do I?" He came over for a closer look. I'd put him in a tough spot. If he said no, I'd think I looked like some sort of horrible zombie with brains spilling out of my head. "Uh, yeah, sure..."
I reached out my hand for the mirror. Pro Tip: If a nurse offers you a mirror post-facial surgery, don't take it. Whatever you're imagining doesn't compare to what you'll actually see. That "bubble" I felt on my forehead? That was real. There was a hugely swollen lump on the left side of my forehead. Huge. Like, an inch high off the surface my forehead and three inches in diameter. Then, in the middle of the huge lump, was the surgical site: It looked exactly like it would have if Dr. N had taken a melon baller to my lumpy forehead. I kid you not. In fact....I never did look at her tool tray...maybe she did. Instead, I found some words: "Holy...Oh my...That? I can't...That's on my forehead? I can't...Oh my god that's...I can't believe that's MY FACE?!" They weren't very eloquent. Finally, I managed, "I just hope there's no more basal cell in that face." She bandaged me up, sent me to the waiting room and sent my cancery forehead to the lab. I sat there, trying to read, but watching the clock tick closer towards Kindergarten Orientation. Finally, the nurse called me back. With a silent smile and thumbs up, she greeted me at the doorway. "Dr. N's amazing," I said in relief. I opted to let Dr. N close, rather than wait for Plastics. Plastics may have lowered my chances at a scar with a skin graft, but I wasn't interested in that. And I'm not worried about a scar. 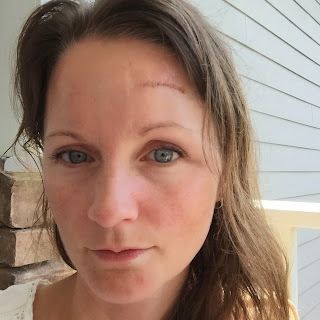 Getting the stitches wasn't terribly uncomfortable: I was able to have a conversation with my favorite Doctor/Nurse duo while they pulled that crater on my face into a straight line. And when I looked into a mirror this time, I wasn't so shocked. A two-inch long Frankenstein stitch-job across my forehead is no match for what I saw the first time. Besides, in pulling my skin together to close the gap, I lost some wrinkles in the left side of my forehead! For Free! The recovery has been easy, too. Aside from needing Tylenol post-surgery, my head has felt fine. As for the scar, I'm working on my Story: Injury sustained when rescuing a baby from a burning building? Bar brawl? Nah, I'll stick to the original...my SPF PSA for life. The day after my surgery, I read about a study out of Sydney that found a lower rate of non-melanoma recurrence in patients who had previously had non-melanoma cancers (like me) when they had taken Vitamin B3 supplements after their initial diagnosis. The timing of that finding was quite helpful. Thank you, Australian Cancer Researchers! Oh, and as for Kindergarten Orientation....there were tears. From both of us... But that's okay. Great to hear that your face returned to its normal size and that the procedure was a success. Hang in there. Cancer is increasing day by day in almost all countries and that is the only reason researchers find various new treatments. If you visit Skin Clinic, then you will easily get cured from your problem. I hope your procedure was quick and easy! I'm so glad you found some answers in my post. :) thanks for reading and for taking the time to leave a message. Omg this was great. I just had Mohs on my forehead (this morning) but I wasn’t brave enough to peak. Still have the bandage and am not looking forward to seeing the damage. I did some retail therapy and bought some cute rash guard - longer sleeve bathing suits and still trying to come up with a “scar story”! LOL thanks for writing this- made me feel better!